When: Tuesday, Oct. 20, 2015 – 9 a.m. to 4:30 p.m. Cost: $100 if you sign up in September. $150 if you sign up in October. Space is limited, so please sign up in advance here. Contact Chris at chris.snider@drake.edu for any questions. Questions? Contact Chris Snider at chris.snider@drake.edu or 515-271-4594. Ready to sign up? Use the EventBrite widget below, or contact Chris if you prefer to pay by cash or check. Multimedia skills are more important for communication than ever. YouTube has more than 1 billion visitors a month. Twitter’s six-second video app Vine has more than 40 million users. And Facebook continues to put a huge emphasis on video (users watch 4 billion videos a day on Facebook). This hands-on course will focus on core video techniques and how to tell stories using video that you shoot on your smartphone. This is not a day of lecturing. We will learn techniques and then apply them immediately by shooting and editing videos. We will shoot video on your smart phones. Accessories for your phones (tripods, microphones, etc.) will be provided. He teaches an intro to multimedia class for first-year students to help them understand how to take great photos and make quality videos. He also taught a video class to Master of Communication students at Drake in the summer of 2015. And, Chris spent part of the 2014 spring semester testing out tools for mobile video with three students as a part of the Drake Mobile Gadget Lab. Visit the Eventbrite page to reserve your spot. Prefer to pay by check? 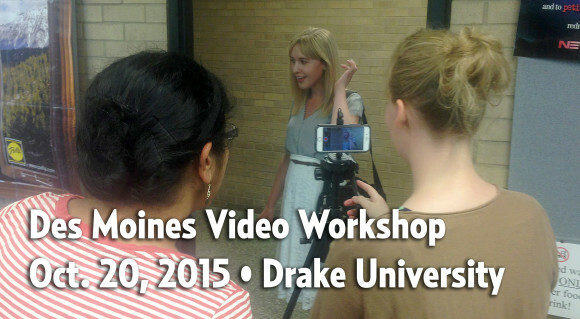 Contact Chris Snider at chris.snider@drake.edu or 515-271-4594.